As early as 1750, ceramic transfers or decals were being used in Europe. As the technology progressed they were adopted by many large manufacturing companies like Spode, Wedgewwod, and Minton. The images, which are printed with incredible detail and color on a paper carrier, are placed in water and will slide off to be positioned on a ceramic or glass surface. When fired to the appropriate temperature, these images fuse with the surface. I spend hours searching eBay, dealers of vintage and closeouts, as well as newly printed images from England, Italy and Germany where most are still printed. With a fine exacto blade and scissors at hand, I cut and place as many as 100 pieces -that’s about my record to date- to create my own design. 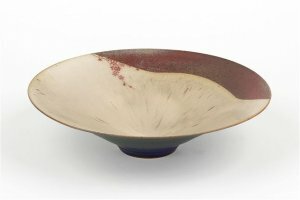 No more than three layers are applied in a single firing. To achieve my desired effects some pieces are fired many times.